Sinu-Care™ - 525 mg, 60 Vcaps™ each (Nature's Wonderland) - Penn Herb Co. Ltd. Cold weather, seasonal sensitivities and clogged sinuses can make life downright miserable. 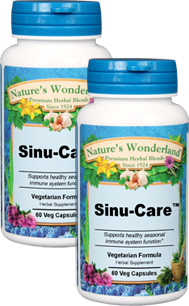 Sinu-Care™ is a powerful blend of herbs that supports clear, free breathing. Stop suffering and get soothing relief today! Chicory Root, Celandine Herb, Knotgrass, Speedwell, Sage, Nettle Leaves, Coltsfoot, Mullein; Plant Cellulose (Vcaps™) - vegetarian capsules. As an addition to the daily diet, take 1 or 2 capsules, 3 times daily with water at mealtimes. NOT TO BE USED DURING PREGNANCY OR WHILE NURSING. EXCESSIVE OR LONG TERM USE IS NOT RECOMMENDED.